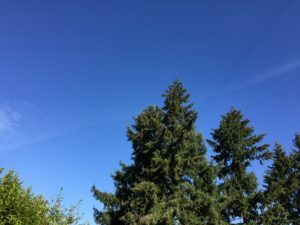 My friend Mary reminded me of that old song that includes the line that the bluest skies you’ll ever see are in Seattle. These October days show clearly why someone might have that thought. It is rare for Seattle to have such a string of beautiful, clear, vivid days like we have been having. In such a stretch as this, it is easy to forget the unending days of rain, the relentless gray that once made Seattle the suicide capital of the nation, and the storms of winter that are escalating in recent years with more ice and snow than the locals (not to mention the thousands of new folks) know quite how to deal with, considering the seven hills on which Seattle was built. It is easy to give thanks on days like this, when we feel blessed by the warm sun and the gorgeousness of the changing colors of autumn. But the days will return when we simply have to know that the blue skies are up there somewhere, when we have to have faith that warm days will be with us again, when we will give thanks even though there appears to be less reason to do so. And the reason we will do that is because the Bible is clear: “… in every situation [no matter what the circumstances] be thankful and continually give thanks to God; for this is the will of God for you in Christ Jesus.” 1 Thessalonians 5:18 (AMP).